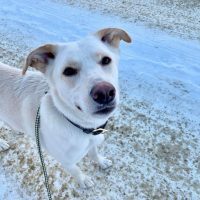 My pick this week at the Peace Regional SPCA is Tundra! She is a 2 and a half year old Lab mixed with a shepherd. Tundra was surrendered to the shelter in February and she has some common separation anxiety.She is a very sweet girl who just wants to be with people. Tundra has been crate trained by her previous owner and she also knows basic obedience commands like sit, and lay down and she also walks great on a leash. Tundra hasn’t been socialized very much in her life so at this point she doesn’t seem to like other animals. She also hasn’t really been exposed to young kids so a family with older kids would be better. If you’re interested in Tundra then head down to the Peace Regional SPCA! They are open noon – 5 everyday!